When multiple sections of code are set to hide, I expand one set and the other sections triangles are gone! There is still a jump in line numbers and the code still exists (somewhere!). just select the endpoint and startpoint of the hidden lines and press alt+h or context menu hide lines then they will reappear. hidden lines are NOT overlapping. now the triangles for 10-15 are gone! Try it yourself and let me know if you get the same result. Also, selecting the start and end lines + ‘alt+h’ simply hides two more lines. at least the one I know. selection like in the picture. Press alt+h and you get a new hidden triangle set, click on it and all hidden lines are visible again. But I see - there seems to be an additional glitch - maybe I try to investigate. Nevertheless, the npp exit seems not necessary to me. I need help understanding how to get the triangles back without exiting the app. I seems anytime a hidden section is made visible again, all other hidden section triangles are gone. after you show line 3-10 lines 4-8 are visible too. in a new pair of triangles which then could be expanded to show the “lost” hidden lines as well. If this doesn’t work for you, try brute force method, select all, hide all lines, expand it. Of course results in no hidden lines anymore - but I guess better than restart npp. oopss - seems to be that it has been already reported as an issue some time ago. From first look it is rather an npp issue than a scintilla one. Try to get enough information to prove that it is and will update github issue accordingly. I don’t understand, if this has been reported why isn’t anyone assigned to the issue? Why would end users be responsible for proving it? I try to get enough information to prove that it is and will update github issue accordingly. Let me know in case you want to have. … if this has been reported why isn’t anyone assigned to the issue? This could very well be my all-time favorite posting on this site. I don’t even have “triangles”, nor do I want them. I hid a line and there is no Un-Hide. Very frustrating. I can confirm: I just hid a line (got the triangles), then hid a second line adjacent to it (getting another triangle). When I then hit the triangle to unhide the second, both triangles disappear, but the first line is still hidden. If I go to a second tab and back, the line is visible again. (This is a similar sequence to what’s described above). 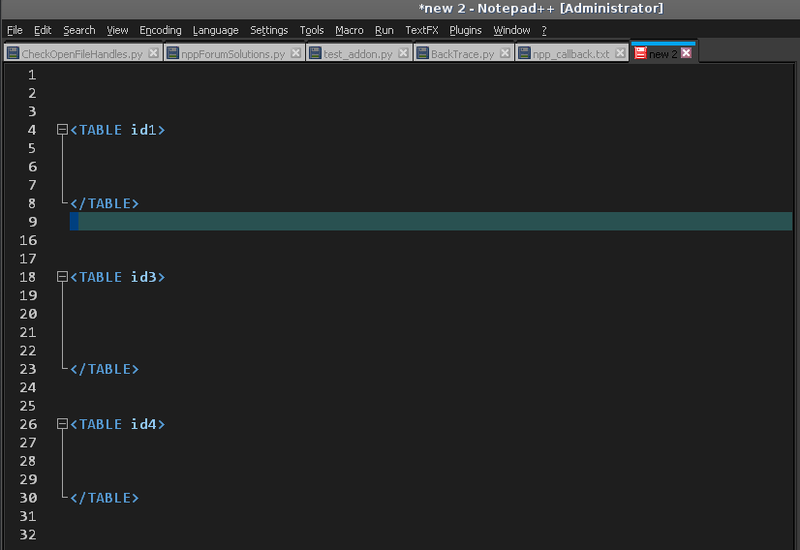 The hide/unhide lines feature of Notepad++ is problematic and best avoided IMO.